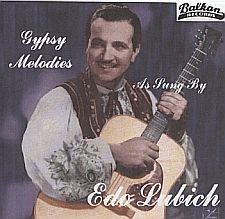 Edo Lubic was born in Donji Vakuf, Yugoslavia, on May 7, 1912, son of Nikola and Klara Lubich. As is generally the case with gifted individuals, in music or any other field, Edo became a tamburas at the tender age of five when his dad acquired a bisernica (made of cardboard and plywood) and so began a musical career which was to span two continents and cover a period of 70 years. At the age of 10, Edo received his first 'real' bisernica and proceeded to master all the tambura instruments in both Farkas and Sremski systems. At the astounding age of 14, Edo organized his first tamburitza band in his home village, consisting of seven to ten members. Edo was organizer, leader, instructor, and made the arrangements for all the instruments. Edo attended a Jesuit's Gymnasium in Travnik, Yugoslavia. After this Edo went to Zagreb to study music and singing. After a year of studies in Zagreb, Edo decided to go to France to study Electrical Engineering for the period of 1929 through 1933. 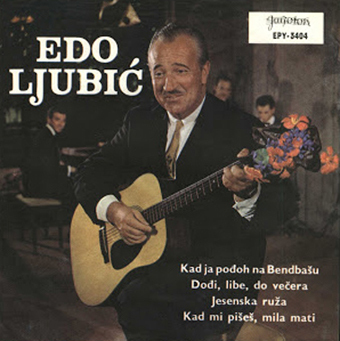 After France, Edo returned to Yugoslavia and due to certain circumstances, began to sing professionally, rather than following an engineering career. Shortly after embarking on a singing career, a very good friend of Edo's, who was from a very prominent family in Belgrade, committed suicide and had left a request for Edo to sing his favorite song, which was at that time one of Edo's big hits, namely Kad Mi Pises Mila Mati (When You Write to Me Dear Mother) during his funeral. This last wish of Edo's friend was included in Edo's Belgrade radio program which coincided with the funeral, and needless to say, Edo's popularity zoomed to unprecedented heights resulting in his receiving offers to appear in almost every capital city in Europe. Included in his European tour was Paris, Budapest, Rome, and Berlin. At a later date, Edo appeared in Berlin on a television show. Edo was the very first Yugoslav to ever appear on TV! Edo also made a short film that was included in Europe's movie history as the first found film from Yugoslavia. This was in 1937. 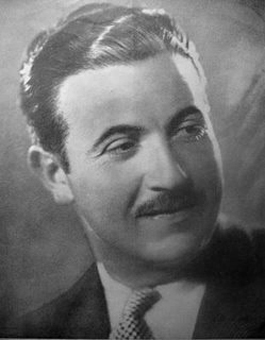 Prior to World War II, Edo, with his Belgrade radio show, was Yugoslavia's premier singing star. He was voted Yugoslavia's third most popular man in 1936. Edo's singing style was unique which was an inspiration to tamburasi in the United States. Edo's song interpretations were very different and attractive to all tamburasi and tamburitza music lovers across the country, relating to the songs of that time. It would be very difficult to select any individual who has promoted Yugoslav music and songs over so vast an area for so many years as has Edo. 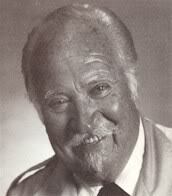 Edo made many recordings on RCA Victor, Columbia, Decca, Balkan International, and Sonart. These recordings enhanced Edo's reputation and image to such a degree that he was selected to go on a four-year tour of the United States, appearing before high school and college students. It's estimated that more than 2 million students were fortunate to have been entertained by this most gifted musician during his four-year assignment. His presentations included the songs of Serbia, Croatia, Macedonia, Slovenia and, of course, his native Bosnia. Edo appeared at concerts with such tamburitza greats as Steve Pavlekovich, Milan Verni, the Baich Tamburitzans, Blue Danube, and made recordings with the well known Sar Planina (Marty Kapugi Band) and also with Vinka Ellison. Edo also appeared with the famous Popovich Brothers band. Edo opened his first well known restaurant, frequented by many entertainment celebrities, called 'La Place' (The Place) and later opened another restaurant called 'Edo's Other Place'. These were both very successful restaurants in the Century City, California, area. Edo sold both restaurants in 1978 and semi-retired; he is living in Palm Springs, California. Edo travels to Europe every year, and in 1985 appeared in a feature movie in Sarajevo, Yugoslavia, which is currently having its premiere showing. Edo is a widower, his wife having passed away nine years ago. Edo has a daughter Nicolette and a granddaughter Victoria who is 14 years of age. Edo is forever grateful for the assistance and support from the Croatian and Serbian colonies in the U.S. during his long and sometimes trying times. This support and assistance from the various lodges and organizations made it possible for Edo to carry on for so many years. Edo wants to offer his special and sincere thanks to all for their assistance and cooperation. Edo is not certain he will return from his annual visit to Yugoslavia in time to attend the 1986 Extravaganza to be held in Minnesota but will make every effort to do so. Edo wants to convey his sincere thanks to the TAA committee for the honor of being selected as a candidate for appointment to the TAA Hall of Fame. He also expresses his best regards to his many old friends and supporters who are still with us. Hoćeš, nećeš, moraš / Oj Livado - Edo Ljubih / Kapugi Balkan Tamburitza Orch, VIC V-3141. A-. Tiha noći / Sremsko - Edo Ljubić / Mirko's Tamburitza Orchestra, VIC 25-3057. A-. Došla Drina / Tko se ono bregom šeće - Edo Lubić & Banat Tamburitza Orch, Sonart M-606. A-. Zlatan grivna / Meglata padnala - Edo Lubić & Banat Tamburitza Orch, Sonart M-604. A-. Lola / Hoće čiča - Edo Ljubić & Banat Tamburitza Orch, Sonart M-605. A-. Seoska lola / Oj jesenske duge noći - Edo Ljubić / Olga Turković & Banat Tamburitza Orch, Sonart M-6097. A-. Sjećaš li se onog sata / Sinoć si meni rekla - Edo Ljubić / Olga Turković & Banat Tamburitza Orch, Sonart M-608. A.
Leti, leti / Golub - Edo Lubić & his Ensemble, COL 1063-F. A-. Misirlou / Osman aga - Edo Ljubić & his Ensemble, COL 1261-F. A-. Leti, Leti / Golub - Edo Lubić & his Ensemble, COL 1263-F. A-. Sunce jarko / Kupite djevrečke - Edo Ljubic / Continental Recording Orch., Continental C-205. A-. Halaj Gigi / Milica kolo - Edo Ljubić w / Continental Recording Orch., Continental C-206. A-. Mori vrcaj konja / Imati li pari - Edo Ljubić / Continental Recording Orch., Continental C-207. A-. U mom selu / Milovo sam garave i plave - Edo Ljubić / Kapugi Balkan Tamburitza Orch, VIC V-3122. U mom selu / Milovo sam garave i plave - Edo Lubić / Kapugi Balkan Tamburitza Orch, VIC V-3132. A-A-/B+. Naš život ciganski / Gon' goveda - Edo Ljubić / Kapugi Balkan Tamburitza Orch, VIC V-3125. A-. Naš život ciganski / Gon' goveda - Edo Ljubić / Kapugi Balkan Tamburitza Orch, VIC 25-3030. B.
Misirlou / Kradem ti se - Edo Ljubić / Kapugi Balkan Tamburitza Orch, VIC V-3127. A-. Po mjesečini / Moj živote gorak li si - Edo Ljubić / Kapugi Balkan Tamburitza Orch, VIC V-3138. A-. Djevojka sam / Kaži mi Nevenko - Edo Ljubić / Kapugi Balkan Tamburitza Orch, VIC V-3140. A-. San ljubavi / Aj bona Janjo - Edo Ljubić / Kapugi Balkan Tamburitza Orch, VIC 25-3029. A-. Jedna cura mala / Mico, Mico - Edo Ljubić / Kapugi Brothers Tamburitza Orch., Balkan 550. A-(45 rpm). Sanjaj Marelo / Izgubljeno jagnje - Edo Ljubić / Kapugi Brothers Tamburitza Orch., Continental C-201. A.
Hladni vjetar / Moj se lola opio - Edo Ljubić / Milan Verni Victor Tamburitza Orch, VIC 25-3017. B-. Ća je lipo u Splitu živit / Mislim rano, pile moje malo - Edo Ljubić / Milan Verni Victor Tamburitza Orch., VIC 25-3016. A-/B+. Hajte braćo - Hajte sestre - Edo Ljubić / Victor Orchestra, VIC V-3145. A-. Neven kolo / Mladi lovac - Edo Ljubić with the Kapugi Bros Tamburitza Orch., Continental C-202. A-. Stara majka / Dalmatinski napjevi - Edo Ljubić with the Kapugi Bros Tamburitza Orch., Continental C-203. A-. Dalmatinske melodije / Nikoga drugog ljubit neću - Edo Ljubić with the Kapugi Bros Tamburitza Orch., Continental C-204. A-toB+. i stihove napisao, rano i tragično preminuli pesnik, Dragutin B. Ilić. Vladan Rakanović: WHO IS EDO LJUBIĆ? Jutjub je stvoren za mačke a ne za ljude. Samo mačka ili bar čovek-mačor, može da svojom radoznalošću, gledajući spot Emine Jahović, preko koncerta Metalike, završi na Edi Ljubiću. Edo? Who is Edo? Isto to sam se pitao i ja kada sam video preporuku za gledanje. Klik na jutjub spot me je prilično razgalio. Talas nostalgije i nedoživljene romantike, upotpunjavala je slika čoveka sa brkovima, koji je svojom pojavom verovatno, u ona vremena, značio isto što i Čola šiparicama znači, poslednjih 30 godina. Uobičajena de-beovska provera preko gugla, nije dala neke posebne rezultate, ali je ono šturo što postoji na engleskom jeziku, bilo dovoljno da za sva vremena zapamtim ime Ede Ljubića. Dakle, saznajte "Who is Edo Ljubić? ", a pre svega uživajte preko jutjuba u njegovim pesmama. Edo je rođen 7. maja 1912. u Donjem Vakufu. Otac Nikola, majka Klara Ljubić. Sa pet godina je počeo da svira tamburicu koja je bila napravljena od kartona i šperploče. Sa deset godina je dobio svoju prvu "pravu" tamburu i do četrnaeste godine je već postao pravi muzičar i autor, koji je imao svoj sastav. Nakon jezuitske škole koju je pohađao u Travniku, koja je bila uglavnom rezervisana za decu iz imućnijih porodica, Edo je otišao na muzičke studije u Zagreb. Tamo se nije dugo zadržao i ponesen mladalačkom strašću, odlazi u Francusku na studije elektrike. Školovanje u Francuskoj je u periodu od 1929. do 1933. prošlo, ali se naš Edo nakon povratka u Jugoslaviju, odlučuje radije za karijeru profesionalnog pevača, nego inžinjera elektrike. Neobičan događaj je od Ede napravio zvezdu. Ubrzo nakon početka pevačke karijere, Edin prijatelj, koji je bio iz vrlo ugledne beogradske porodice, počinio je samoubistvo. Poslednja njegova želja je bila da na sahrani Edo otpeva pesmu "Kad mi pišeš mila mati". Na talasima Radio Beograda, koji je pratio ovu sahranu, preneto je i Edino izvođenje pesme, i munjevito pevač postaje velika zvezda, koji počinje da drži turneje po Evropi. Pariz, Budimpešta, Rim, Berlin. Svi oni padaju pod harizmom neverovatnog Ede Ljubića. Poseban kuriozitet je pojava Ede Ljubića 1937. godine na nemačkoj televiziji!!! Tako Edo postaje prva osoba sa prostora Jugoslavije, koja se pojavila na televiziji. Edo snima i film, koji ulazi u anale evropskog filma, kao prvi biografski film iz Jugoslavije. 1936. godine Edo je bio treća najpopularnija ličnost u Jugoslaviji. Edo odlazi u Ameriku, a šestomesečna viza, je zbog početka rata, odlukom američke vlade, postala i svojevrsna doživotna viza. Ono što Edu stavlja u red pre svega prosvećenih ljudi, vernih patriotskom nasleđu i tradiciji, jeste što je on jedina osoba iz Sjedinjenih Država, koja se prijavila kao dobrovoljac u ratu, na poziv izbegličke vlade. To je trebala da bude još jedna bombastična akcija naših političara i da se talasi i talasi naših iseljenika u Americi, kao i njihovi potomci, prijavljuju za rat i oslobođenje mile im "Tamo daleko" Srbije, a od svih sve spade na samo jednog čoveka. Edu Ljubića, pevača. U Kanadi se prijavila isto samo jedna osoba. Izvesni Dabić. (Neđeljko B. Plećaš — Ratne godine 1941—1945 ). Na poleđini gramofonske ploče pod nazivom "Edo Ljubić i njegova pjesma" koju je izdao zagrebački "Jugoton", na kojoj se nalaze četiri Edine pesme, stoji da je on "za vreme II svetskog rata učestvovao u borbama kao pripadnik avijacije". Tamo daleko je poznata srpska tradicionalna pesma iz Prvog svetskog rata. Reči pesme peva srpski vojnik na Krfu, nakon surovog povlačenja preko albanske golgote. Pesma se po mnogima smatra za himnu koju peva srpski vojnik kada odlazi da se bori za svoju zemlju. Reči pesme govore o ostavljenom selu, spaljenoj crkvi i povlačenju preko Albanije u kojem su mnogi ostavili svoje živote. U Americi, Edo je ostavio veliki trag, kao priznati muzičar, uglavnom se okrećući svojoj prvoj ljubavi, tamburici. Nastupao je sa brojnim sastavima, i snimio veliki broj ploča. Otvorio je i dva čuvena restorana, "La Place" i "Edo's Other Place". Životna saputnica se upokojila pre njega, tako da je kraj života sačekao kao udovac, uz ćerku Nikoletu, i unuku Viktoriju. Žena mu je bila Mađarica, i kad god bi došlo do nekog nesporazuma ona je njega na madžarskom grdila, a on nju na srpskom. Kako oboje nisu znali maternje jezike onog drugog, nisu se nikad zvanično ni posvađali, kako je tvrdio Edo. Izvodio je svu muziku sa prostora bivše Jugoslavije, a najviše su mu ležale pesme iz njegove rodne Bosne. O Edi Ljubiću mnogobrojne priče su preko noći prestale, kada je na vlast nakon rata došao partizanski establišment, koji je imao svoje zvezde i zvezdice, a diktat partizanskih marševa, zamenio je baršunaste glasove, i burne kafanske večeri. Ime Ede Ljubića je nešto što ne sme biti tek tako izvađeno iz naftalina sećanja, već biti pohranjeno u obavezno muzičko štivo, svake osobe sa prostora bivše Jugoslavije. Najbolji način za to je upravo Jutjub. Verovatno poslednji javni nastup, Edo Ljubić je imao u filmu svoje rođake Vesne Ljubić. "Poslednji skretničar uzanog koloseka" je film iz 1986. godine, gde Edo igra ulogu starog železničara. Scena u kojoj tada već vremešni Edo, na gitari izvodi sevdalinku "Ašik osta na te oči", pokazuje koliko je tadašnja jugoslovenska javnost (radni ljudi i pregaoci, kako su ih zvali), bila uskraćena , "tihom zabranom izvođenja", velikog patriote, a pre svega velikog umetnika i čoveka, Ede Ljubića. Edo Ljubić je umro 15. marta 1993.